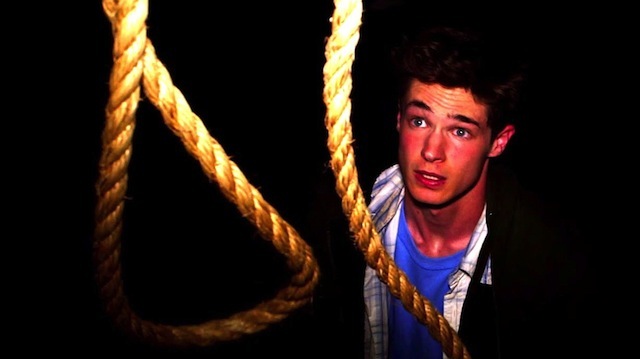 Don’t go see The Gallows, please. As someone who passionately, deeply loves movies, especially horror movies, and laments that not nearly enough genre offerings actually land a theatrical release, I beg of you, please don’t go see The Gallows. It will only encourage people to churn out lazy, worthless crap like this. Just because you can crank out a movie quick and on the cheap, and it will make money, that doesn’t mean you should. The Gallows is like someone set out to take every last complaint anyone has ever levied against found footage horror and purposely made a movie using only those elements. Because I want to see more horror in theaters, more horror films with a wide release, I try to support them as much as I can, but there is nothing here to recommend. There’s a single legit jump scare, one, and that’s the only redeeming piece of the entire 81 minutes. This is a movie so completely uninspired that the names of the four main characters are just the names of the actors who play them. Reese (Reese Mishler) is a jock who quit the football team to take drama because he likes a drama nerd, Pfeifer (Pfeifer Brown). He has a dickhead best friend, Ryan Shoos (Ryan Shoos), who just so happens to film every single thing that ever happens and has a stereotypical blond cheerleader girlfriend, Cassidy (Cassidy Gifford). Reese is a terrible actor who somehow landed the lead in the play, which just so happens to be the same play where, back in 1993, a kid named Charlie was accidentally hung. Or was it an accident? This is a notorious moment in their small Nebraska town, so, of course, you’re going to want to do that again, exactly like before. Sure. When Reese, Ryan, and Cassidy break into the school to trash the set and stop the play, they encounter Pfeifer, and then spooky stuff happens, like lockers open, doors that are supposed to be unlocked are locked, and they have no cell reception. It doesn’t take any imagination to figure out where things go from here. A generic story isn’t the problem; it doesn’t help matters any, but it’s something you can get away with if there is anything else to focus on, but there’s not. Not only is the plot entirely predictable, much worse than that, The Gallows is boring as hell. The first 20 minutes of a movie that is, again, only 81 minutes long, is spent on set up where you repeatedly learn the single defining character trait of each character, which, if you missed them, are: Reese wants to bone Pfeifer, Pfeifer really wants to stage this play, Ryan is a jackass who torments nerds, and Cassidy is a cheerleader. At best, you don’t care if they survive, and you don’t root for them to die because they aren’t even that interesting and you can’t get that engaged. The team stumbles through one horror trope after another, each more tedious than the last. They discover a secret hallway, they split up for no reason, they discover a convenient photograph that illuminates the shocking backstory that is never really mentioned again, there’s a “twist” that is obvious from the first moment. Again, you can get away with this is something even remotely entertaining happens, but the pace plods along hitting all the mile markers until the credits role and it’s time to leave the theater. The ambiance is a jumbled mess of ominous tones, dim corridors that are illuminated just enough for you to see the spooky thing lurking in the background that no one else notices, and cameras rolling in situations where no one would ever possibly film anything. Who films while climbing a ladder? Sometimes they need it for light, sometimes it cuts back and forth between a camera and a cellphone that has night vision, and it changes hands so often and so quickly that you spend a great deal of time wondering who exactly is holding the damn thing.